New Performance in Chile confirmed Festival Internacional de la Cancion de Viña del Mar - Friday, February 25, 2011. Confirmed today, Sting's Symphonicity tour, featuring his greatest hits re-imagined for symphonic arrangement, will appear at the Viña del Mar Festival in Chile on Friday, February 25. Considered one of the most important musical events in Latin America, this festival has been held annually since 1960 and features song competitions in two categories (pop and folk), plus performances by renowned International artists. Sting's performance on Friday, February 25th marks his second appearance at the festival where he previously performed in 1982 with The Police. Members of the Sting fan club will have the opportunity to purchase tickets beginning Thursday, December 16th at 10am (local) through Tuesday, December 21st at noon (local). 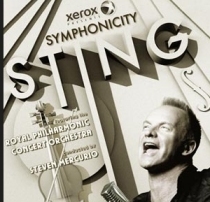 For complete tour and ticket information, visit: www.sting.com. On December 10 Sting appeared on the Charlie Rose show in an interesting twenty minute long interview segment. On behalf of his album (Symphonicities) and new DVD/CD (Live in Berlin), Sting will sign copies of each release at FNAC on Via Torino in Milan on Saturday, December 18 at 9:30PM. To gain access to this special event, fans must purchase Symphonicities and/or Live in Berlin on December 18.